INTEGRATE your knowledge of industry trends and higher education challenges to co-create solutions. Inviting campus auxiliary service executives working at a senior leadership level with oversight of multiple services, vision for campus transformation, and the acumen to create integrated services that achieve this vision. 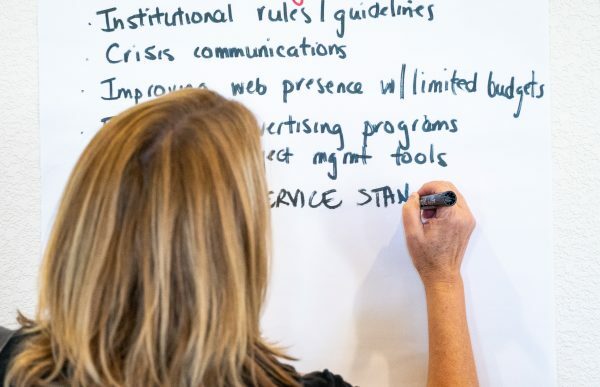 Participants gain an understanding of critical industry trends, impactful business models, and higher education challenges, while working in an immersive environment to co-create solutions to these challenges. This event is part of the NACAS Leadership Series, presented by PrismRBS. Share your expertise at Summit and don’t be afraid to get vulnerable. If you have areas in which you need advice from your colleagues, the open discussions will allow you to share and debrief. Educational sessions will allow you to compare best practices and trends, gain insight and ideas, and make sure you are staying in the know. This is a space for collaboration and confidence. You will leave this event feeling confident that the leadership decisions you make today will positively influence your campus for years to come. Boston’s Most Beloved: The historic charm and contemporary elegance of the iconic Boston Park Plaza awaits. The cherished Boston landmark has been fully restored and reimagined through a $100 million renovation. Enter a destination that has been the heart of Boston for 90 years, and feel the vibrancy and style of today, with a spirit inspired by the past.